We discovered a huge horseshoe of molecular gas (CO) around the center of the the Blue Compact Galaxy Mrk86. That gas has been swept out from the galaxy's central regions during the evolution of a massive starburst. This process started about 30 million years ago when the first of a series of supernovae in the starburst exploded. 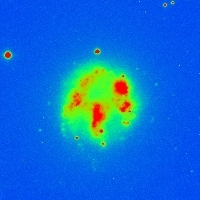 This result complemented with previous observations in visible and near-infrared confirm the scenario of a ring of clusters of newly formed stars coinciding with the position of the horseshoe of gas.